Unicornalia Returns Nov. 20 – 26! Unicornalia Returns July 24 – 30! It’s a Triple Threat! Mechs, Budgies, and Unicorns, Oh My! Celebrate April with a most foolish mount, the mighty Squirrelicorn! 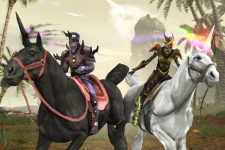 Rift Universe: Question for Trion RE: Nebula Mount.